said Wednesday that the U.S. government is responsible for the leaking of hundreds of thousands of classified diplomatic memos and cautioned against blaming the website that published the secret cables and its founder. In an interview with MSNBC on Wednesday, Assange called Manning a political prisoner and said he believes the U.S. is trying to get the soldier to testify against him. He called on human-rights organizations to investigate. You can attribute political motives to anything – including serial killing, if you're willign to torture post-facto wordplay and PR Tonsil Hockey. Did that make Jeffery Dahmer a “political prisoner” too? This is what the bien pensent global governance simpletons call justice and transparency: any sort of treason that makes them feel good. That really is how limited they are in depth and complexity. In the readers' section of Mark Frauenfelder's Boing-Boing article on shotgun safety, Instapundit notes the "the wussy comments from Brits. Pathetic." As a dual national (Danish-American) living in Europe, I am no longer surprised by the Euros' (self-serving) superior attitude to the United States, as well as that of their leftist American enablers. When I am told of how superior Europe's gun control, and its (allegedly) attendant lack of guns and its (allegedly) attendant lack of violence, are to all that mindless violence in the United States, I ask: "Do you mean, in an American city such as… Marseille? Or an American city such as… Bastia? Or an American city such as… Palermo?" For a gun-free zone like Europe, France for one has recently seen a plethora of crimes with automatic pistols, Kalashnikovs, and explosives. Oh! say the Euros (after a few seconds' thought — they have to process this, you understand), but those murders are committed by gangsters! Those are the Mafia, you see! Suggesting that — by some strange, and immutable, natural law of the universe, or by some kind of honor amongst thieves that is never broken by any individual, not a single one — the mobsters (or those in Europe, at least) never use violence upon your average, honest citizen; they only commit violence amongst themselves! Note to fairy tale-believing Europeans: the main target of most criminals in most countries is indeed the honest, common (hopefully defenseless, peaceful, and non-violent) citizen (rich or otherwise), not other criminals. Having said that, it turns out that much of the gun violence in the United States is also between criminals. It is also important to know what is being compared: (open-society) America, unlike (closed- — or more-closed- — society) Europe, allows for many more figures than Europe does; notably, it allows for a full slew of statistics. Because the killed-by-firearms statistics, notably, are given as is — as figures with no explanation as to the context of the shootings (an honest citizen gunned down by a mugger? a schoolboy riddled with pellet wounds by accident? one drug addict shot in the back by another? an intruder killed by a grandmother defending herself?) — unthinking Europeans and their (just-as-unthinking-and-just-as-ready-to-jump-to-(self-serving)-conclusions) American enablers imagine shooting by firearms to be endemic throughout American society — an indelible aspect of American life — and go around parroting phrases such as "(Any and all) Americans are always ready to shoot one another!" while mocking the (artificial) caricatures of "people [living] with … constant fear in their lives". Meanwhile, the Europeans' own (statistics-deficient) killings are always to be accompanied by some sort of qualifier which minimizes the deeds (intra-mob violence, etc)… Notice the bemused witness of a bank robbery in the TV news report who describes the "war scenes" in Seine-Saint-Denis (00:33) as "unrealistic, it's like being in an American [!!] movie." I think a nice classic film is a nice thing to share today. It's a romantic comedy/drama about the trials of a couple who meet, fall in love, and face life's challenges. It's George Stevens' Penny Serenade, starring Carey Grant and the delightful Irene Dunne. In a land called America (thanks to Larwyn), Rian B. Anderson on "the best Christmas of my life." The superiority of Germany’s so-called “social market economy” is an article of faith for virtually all of Germany’s major political parties (with the possible exception of the “post-communist” Left Party, which would prefer an outright socialist one). The expression is commonly associated with Ludwig Erhard, post-War West Germany’s first economics minister under the Christian Democratic Chancellor Konrad Adenauer. In current usage, the expression strongly connotes a rejection of a “pure” market economy or “unbridled” capitalism, such as the advocates of the “social market” model presumed to exist in the United States and other “Anglo-Saxon” countries. Which I suppose would make me (as I’ve pointed out to the pointiest of French heads,) an Arab Anglo-Saxon. I thus ask how that can be. Easy: the same way you can have a society inspired by the Christian moral ethic called “Sharia compliant™©®” a few centuries later. Those clowns would sell their Grandmothers for a nickel. There is no longer any such thing, especially if you think it will defend you from harm. The Swiss are defenseless. Who cares, you ask? The Swiss do. They just aren’t in any position to do anything about it. René Zeller writing in Neue Zürcher Zeitung where he is the domestic affairs editor, discusses a 2010 official army report. The Swiss are not in a position to defend themselves on their own. "Independently of party colours, it must be understood that left to its own defences Switzerland cannot defeat a single terrorist group, that autonomous defence is unrealistic against airborne attacks and that ethnic gangs couldn't care less about where borders lie. The Federal Council, the defense minister and the head of the army should be more stout-hearted. If they meekly limit themselves to focusing on the lowest security denominator Switzerland's defense will be nothing more than empty sabre-rattling." Picture an integrated “pacifist” Europe, and a similarly passivated Switzerland. The societal response to a social disturbance to that calm has been feared by many an observer to look more like a pagrom than a judicious defense response: which may be the only thing these senile citizenries may be able to do quite soon. To wit, their ability to sell anyone their beautifully machined small-arms will do nothing for their own stability either. What could emerge is a continent-sized plane of chaos, where all security and self-defense is local. Some county-like elements might do better than other, but setting aside the appurtenances of ‘Alternate history’ novel, the Swiss government report is uniquely aware of one thing that the bien pensant European zeitgeist might not: that gangs, tribe-like drug operations, and ideologically driven terror organizations aren’t going to respect borders for the sake of some concept of sovereign integrity. They just aren’t. Just like with GWOT, the idiot’s arguments against it that dwell on the Geneva Convention and some nebulous misinterpretation of what International Law is, draw civil society into a greater and more insecure exposure to personal harm – to be “martyred” for a cause not of their choosing. They will not care about Switzerland’s neutrality, its’ self-interest, or ‘global persona’. Are the collectively thoughtful looking for a gift ideas for “Winter White Night”? 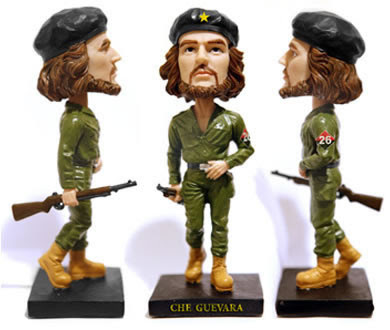 Then go no further than to fuel the petit bourgeoisie behind the Ché bobblehead. Planes and Trains Cancelled: "Kindly Postpone Your Christmas Holidays Until February!… Thank You for Your Understanding!" The crisis of Europe is a crisis of values. In the last few years there has been no equivalent of the idealism that cemented the European project back in the 1950s. I am on the side of those who believe that ideas do matter and that the EU cannot simply be run by competent technocrats (no matter how efficient they may be). Technocrats may offer a brain to the EU project (although this is debatable!) but they cannot offer a soul. And it is the soul that is currently lacking in the European project. Actually, you don’t sound like that at all. You sound like someone who is comfortable with the idea of non-management of the mechanism of a state with unchecked powers led by an ideological class that doesn’t share, preferably without a means of succession of power consistent with societies outside of the third world. Plus, the world knows how Europeans have historically filled power vacuums, even when practicing some form or another of participatory government. Somehow kreeping leftist authoritarianism is what they’re left with – even the feel-good stuff ends up looking like Soylent Green in one way or another. Too many commentators focus on covering the current European financial problems. Although the deadlocked financial situation of the EU cannot be disregarded one should also pay attention to the political/ideological vacuum of the European Union. A crisis of ideology is also evident in the EU. The uncritical acceptance of a deregulated free-market vision within the EU circles has damaged the economy of the Eurozone and is no longer viable. The EU became a political space where a conservative free-market mentality has gradually taken over without any major thinking and debate. This kind of “acquis” has silently been imposed in every EU policy area by the large majorities of the EU establishment. Funny how some world-views are expected to defend their lives, and take the heat for all of the world’s problems – even those caused by the irrational, never-ending expansion of the welfare state. In France, which is always giving lessons to clueless Yanks regarding such things as violence, trusting in the police (and in other authorities), and gun control versus the obsolete right to bear arms, there has been a surplus of violent crime sprees recently — notably in Seine-Saint-Denis — with witnesses refusing to speak unless under the cover of anonymity, with outlaws using "battlefield weapons", and with journalists speaking of "scenes of war". envoyé par lemondefr. - L'info internationale vidéo. est survenue au lendemain du braquage plus violent d'une autre agence de la BNP Paribas à Aulnay-sous-Bois. Les malfaiteurs avaient utilisé de l'explosif pour faire sauter le distributeur automatique de billets (DAB) et n'avaient pas hésité à tirer sur les policiers. Un employé de la banque avait été blessé par l'explosion. La brigade de répression du banditisme a été chargée de l'enquête. Depuis environ deux ans, la région parisienne, particulièrement la Seine-Saint-Denis, est le théâtre d'attaques de DAB à l'explosif ou à la voiture-bélier, perpétrées par plusieurs équipes, dont certaines ont été démantelées par la police. Deux personnes ont été blessées, dont une grièvement, lors de l'attaque d'une agence bancaire d'Aulnay-sous-Bois (Seine-Saint-Denis), mardi 14 décembre. Les malfaiteurs, en fuite et recherchés, ont utilisé des armes lourdes contre les policiers arrivant sur les lieux. "It might become as popular as the Minitel"
What? No Rotarians? Focus, now, people! It’s civilization we’re after! The irony is that they tend to trash things and create bad press at events meant to pander to them, and basically exceed to their terms in spite of “the will of the people”. Global warming Heavy snowfalls are causing problems for Europe's trains as well as for Europe's planes, but that means, of course, that the biggest nuisance is for the passengers of those means of transport, some of whom waited for over nine hours in a queue prior to boarding the Eurostar in London. "C'est assez impressionnant, témoigne Jean-Hébert, parvenu à rentrer mardi midi à Paris. Toutes les portes de la gare sont fermées sauf une à Saint-Pancras. A l'intérieur, il y a une très longue file de voyageurs en attente qui serpente, sort, fait le tour de deux à trois pâtés de maison. Il y a bien 3 kilomètres de queue à l'extérieur de la gare et 500 mètres à l'intérieur." …Des amies [de la correspondante du Monde à Londres, Virginie Malingre], arrivées dimanche soir à 18h30 à la gare, pour un TGV prévu initialement à 20h30, n'ont pas pu rentrer à l'intérieur de Saint-Pancras. Revenues sur les lieux, à l'aube, le lendemain matin, elles ont patienté plus de neuf heures dans une file d'attente avant de pouvoir mettre le pied à 16h30 dans une rame. Télézapping : "Je veux un avion grand comme ça !" envoyé par lemondefr. - L'actualité du moment en vidéo. Consider yourself having been Bolkenstiened. "it is the anti-Semitic Moroccans who should emigrate." I hope that you'll appreciate that I saved this one for Christmas. Fearing a planet-wide extinction from a massive asteroid headed towards Earth, world leaders are faced with the inexorable task of ensuring human survival. What would we do without leaders? RAGE is a groundbreaking first-person shooter set in the not-too-distant future after an asteroid impacts Earth, leaving a ravaged world behind. You emerge into this vast wasteland to discover humanity working to rebuild itself against such forces as raider gangs, mutants, and the Authority - an oppressive government regime that has a special interest in you in particular. b) something that "could" happen but are betting won't, so they can peddle it as an existential issue. Why zat, do you ask? In order to have a summit somewhere and appear "to lead". So it makes perfect sense to transpose it into the isolated and auto-stimulatory world of a first-person-shooter computer game. First Che Guevara… Now Julian Assange. Among the half dozen letters to the editor that Le Monde (aka France's newspaper of reference) chose to publish over the weekend in its print edition on the subject of WikiLeaks — besides the letter bemoaning the fate of "the poor American soldier" (PFC Bradley Manning,) who "is risking some 50 years of prison" — is one comparing Julian Assange to none other than Jesus Christ (and Julian's followers to Jesus's disciples). In the rest of his letter (from Montreal — must be another of Québec's fanatic Anglo-Saxon-haters), Christian Feuillette builds on this comparison with bromides such as the one that "in 2000 years, humanity has not evolved and truth is still as hated as ever" and that (therefore) this "enemy of hypocrisy [Julian Assange] will probably end up like Jesus-Christ, crucified by the empire" (Uncle Sam — naturally). But not to worry: the message of this "Christ of modern times" — and what follows is, just to make sure and in so many words, repeated twice in the letter — "will survive him through his disciples and will end by emerging triumphant." Julian Assange, celui par qui le scandale arrive, et qui menace avec WikiLeaks l'ordre du monde, tout comme l'Evangile le faisait il y a deux mille ans, peut être comparé à un Christ des temps modernes. " Ce fou, cet insensé sublime " (comme disait Nerval), ennemi de l'hypocrisie, était alors celui qui menaçait l'ordre établi et ébranlait les colonnes du Temple. Traqué, condamné par les docteurs de la foi, son message lui survivra à travers ses disciples, et finira par triompher. Julian Assange, sur qui pèse déjà une fatwa des docteurs de l'establishment, finira probablement comme Jésus-Christ, crucifié par l'empire. En deux mille ans, l'humanité n'a guère évolué et on déteste toujours autant la vérité. Pourtant son oeuvre de salut public, relayée par ses disciples et par la magie de l'Internet, finira aussi par triompher. …according to the FSHP, the only way a Cuban can get access to the hospital is through a bribe or contacts inside the hospital administration. "Cubans are reportedly very resentful that the best hospital in Havana is 'off-limits' to them," the memo reveals. …The memo points out that even the Cuban ruling elite leave Cuba when they need medical care. Fidel Castro, for example, brought in a Spanish doctor during his health crisis in 2006. This odd little bit of Soviet pre-war propaganda has it's charms: for one thing, there is an imaginary enemy. The film revolves around the establishment of Aerograd, a fictional city on the Pacific Ocean shore. Imaginary, that is, until the hero taunts a Japanese warrior committing Seppaku. It's all in very poor taste, with typical Soviet values. Rather amusing given that the Soviets barely blinked when the Japanese occupies Korea, Manchuria, and committed genocide in Nanjing. It's 1935, so the paratroopers and the aircraft that carry them are almost entirely fictional.